One way to understand the recent history of the British far-right is as a series of attempts to overcome the isolation of fascism, a form of nationalist politics, where among the prime candidates for a unifying national story is precisely the memory of a war against fascism. In the 1960s, John Tyndall tried to revive interwar Nazism, complete with uniforms and copies of Mein Kampf. After the National Front there was the British Movement, who wanted Nazism without Hitler and tried to promote Gregor and Otto Strasser as the revolutionary martyrs of the fascist victory. The British National Party (BNP) calculated that if you could split the old fascist parties of the 1930s in two and lose the street-fighting half, the electoral remainder would be sure of a breakthrough. Indeed, so rapid was the march rightwards of the Labour Party in the 2000s that it left a space which the BNP was able to exploit, winning two MEPs and fifty elected councillors. The BNP had, however, nothing new to say about Islam or the War on Terror and its demise, as the Conservatives and UKIP filled the space available to right-wing electoral parties. This created a further opportunity, which was taken in 2010 by the English Defence League (EDL). Islamophobes with Israeli flags who sang the Dambusters tune in pubs, for a time they seemed to be much more successful than the BNP at articulating contemporary racism. 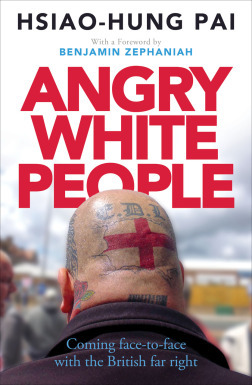 Although there are passages in Angry White People which connect the story of the far-right to that of institutional racism, and there are attempts near the end of the book to situate the EDL’s rise within a broader context, Pai’s book is essentially a study of the English Defence League between about 2010 and 2013, based on a series of interviews conducted principally in Luton, where the group was founded. Pai has spoken to EDL leaders and supporters, sometimes re-interviewing the same people repeatedly over time, and her main characters appear in the book as fully-rounded people, with lives both inside and outside the far right. Historically, the left has lacked a coherent approach towards interviewing fascists: some writers have refused to do this at all, but are then left dependent on interviews conducted by others. Some have spoken to activists from the far right and have been bowled over by them, and the books and articles they have written about fascism have absorbed the fascist version of the history (Stephen Cullen, Robert Skidelsky’s Oswald Mosley). Others, while remaining broadly sceptical of the right, have repeated select parts of the interviews naively, as if the mere fact that Nick Griffin says something distinct about why his party developed a certain way makes it true (Matthew Goodwin). As a result, no-one on the left has spent as much time as Pai has done interviewing and then re-interviewing the same leaders of the EDL since Christopher Husbands in the 1970s. While Husbands’ book resulted in a collective academic and sociological portrait of a different generation, Pai’s approach is a journalist’s: she listens and relates and keeps her commentary brief. Pai is very good on Luton, the town’s poverty and its diversity. She notices a steady influx of people from white minority ethnicities (Irish, Roma) into the EDL and the tensions that arise from the positions they took. The most interesting character Pai interviews is Darren, a cousin of Kevin Carroll, Tommy Robinson’s deputy. Darren lived in Luton and became one of the EDL’s leaders. An anti-racist in the 1970s, he was motivated to join the EDL by intense localism combined with a dislike of the Muslim controversialist Anjem Choudary, whose 2009 protests against Luton troops provided the opportunity for the EDL’s launch. Darren saw the soldiers as workers like himself; he was pro-Palestinian and anti-war, but supported the anti-Choudary protests, understanding them as Luton residents standing up to outsiders pushing them around. Darren mentions having bought Socialist Worker once and having read articles in it against the war in the Iraq but – unlike the 1970s, where the left usually had a base in the very areas that the National Front contested – there is never a sense in Angry White People of the left being any sort of option for potential EDL joiners. The choice is either the EDL or representative politics as usual. In Pai’s book, Darren is a good introduction to the ideological blurredness of the EDL, which in reality runs through much of the organisation. Pai mentions the last book about the EDL, the participant-memoir ‘Coming Down the Road’, but perhaps could have made more of its author’s name “Billy (i.e. the poet William) Blake” and other, incompatible heroes, Bessie Braddock (the doyenne of the old Labour right in Liverpool) and Dave Nellist of Militant. Darren was present on many of the early EDL marches. He listened to the EDL’s anti-racist critics and felt torn. He detached himself from the EDL’s social events, but continued marching. Darren attended the protests with a “black and white unite” banner, testing how much space there would be in this new movement for the diverse group of football supporters who he had thought were its original core. Darren was disgruntled to see Carroll taking his grandfather’s wartime medals to an EDL protest, in order to wave off criticisms that he came from a Catholic (i.e. Irish) background. Carroll was lying to himself and to his supporters, Darren thought. In such clashes, you can see the working out of the kind of tensions that sociologist Satnam Virdee has talked about in his work on the “racialized other”. The liveliest parts of Angry White People are reminiscent of Inso Hasselbach’s book Führer Ex or Matthew Collins’ Hate in describing Darren’s journey out of the far right. By the end of the book he has joined the Labour Party, only to be disappointed by their unwillingness to tackle racism directly. The EDL’s Tommy Robinson, of course, has been going through a more public process of reinvention after his own departure from the EDL. Pai is generous about the local activists who encouraged Robinson to leave. She is, however, gently scathing about the Quilliam Foundation, which was in some financial difficulty when it met Robinson and benefitted from the publicity that accompanied his departure. By the end of her book, you doubt that Robinson can stay away from the far right for long. The third main interviewee after Darren and Tommy Robinson is Paul Sillett of Unite Against Fascism, who is quoted repeatedly without authorial comment. Pai also speaks much more briefly to activists from Sisters Against the EDL, but it is a shame that she saw no need to interview anyone from the Anti-Fascist Network, who have after all been so much more visible than Unite Against Fascism at Dover, in Liverpool, and at many other protests for two years now. Overall, this is an exemplary account of the working class milieu in which a version of the far right began. The main thing I will take away from Pai’s book is the failure of socialists to build in the areas where the present government’s austerity politics have hit hardest. If we are ever again going to have a left of which we can be unambiguously proud, one place it would surely have to prove itself would be in the very terraces and on the same estates where the EDL was born. Ex-SWP writer is less than generous to ex-AFA activists. Who’da thunk it. To be fair, this sounds like a genuinely interesting piece of work. I’ve heard a lot of good things about Pai’s work. Her piece on Lindsey was awful, misleading, defeatist hackery, though. “so rapid was the march rightwards of the Labour Party in the 2000s that it left a space which the BNP was able to exploit”. I don’t understand this. If the LP moved right, then the space it created would be to its left – which was in fact the case, with the brief success of Respect, until we collectively screwed that up. If there was space to the far right, it must have been because the Tories were moving to the centre – which initially under Cameron they seemed to be doing, abandoning the Thatcherite heritage. Ian. I’ve been critical elsewhere of people saying that BNP or UKIP voters were only or predominantly ex-Labour (eg here – https://livesrunning.wordpress.com/2014/10/08/ukip-a-party-of-the-dispossessed-taking-votes-from-labour/ criticising Goodwin for not reading his own data). Undoubtedly some of where the BNP came from was working class Tories without a home (in places where voting Conservative carried a greater social stigma than UKIP or BNP). The BNP was less socially liberally than early Cameron and, yes, that helped them. But some of where the far-right has come from has always been a more eclectic social base (go back to Gramsci and his comments on the “subversiveness” that took some communities from a passive anarchism to a later support for fascism). Whatever else we were good or bad at in the early 2000s, the left didn’t break through in Oldham, Stoke or indeed Luton.